Cam Lo, Quang Tri (16 Feb 2016) – RENEW’s EOD Team No.3 today safely removed a 105mm projectile in Cam Lo District after a village woman spotted the dangerous explosive while tending cows, and reported it. Ms. Nguyen Thi My contacted Deputy Secretary of the Cam Thanh Commune Youth Union, Mr. Nguyen Van Hieu, who immediately called in the location and description of the weapon to one of Project RENEW’s Explosive Ordnance Disposal (EOD) teams. 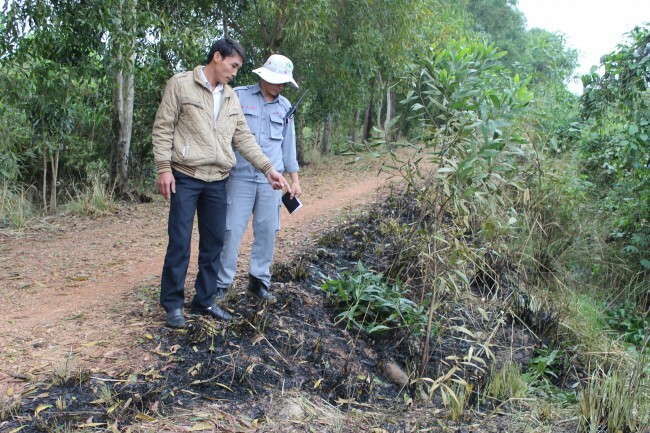 Youth Union leader Nguyen Van Hieu points out to EOD Team Leader Hoang Kim Chien​ the exact location of dangerous ordnance reported by a local village woman. Hieu has participated in Project RENEW’s Community Reporting Network as a collaborator for more than three years. He has helped educate local people on the risks of UXO and encouraged people to report their discoveries to RENEW for timely and safe removal. ​​After ​making the call, Hieu waited ​until the EOD team arrived and then directed them to a dirt road in An Binh Village where the shell was found. Team Leader Hoang Kim Chien measures the ordnance before making decision on how to deal with it. The item had been lying on the road pavement and was not seen until local people ​started clearing and burn​ing weeds. Because the item was safe to remove, EOD Team Leader Hoang Kim Chien ordered his ​personnel to transport the shell to RENEW’s central demolition site for later destruction. 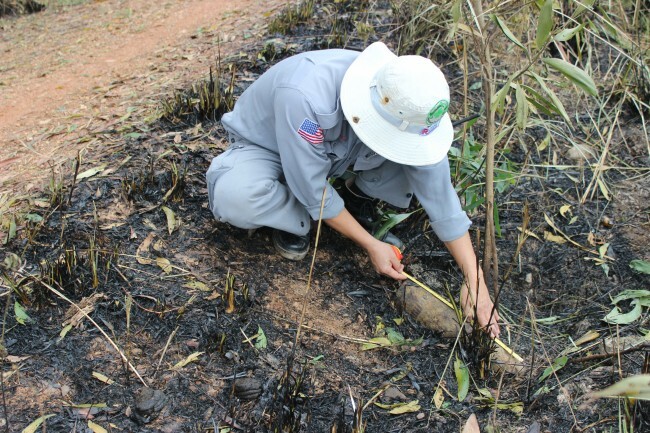 During the first two months of 2016, RENEW teams have conducted 35 EOD quick response tasks, safely destroying 49 items of cluster bombs and other ordnance in Cam Lo District. ​The Risk Education program, which supports the Community Reporting Network, is funded by Irish Aid through Ireland’s Ministry of Foreign Affairs.